Every day we see strategies that are working and delivering results in a rapidly changing world. This Evidence in Action blog series highlights the voices of social innovation organizations and spotlights effective interventions in communities across the country and evidence-based policy and practice leaders to elevate both the results-driven solutions being advanced to help solve our most pressing social problems and to describe the evidence-based federal programs that are critical to developing and scaling effective human and social services. Today we hear from America Forward Coalition member Bottom Line about the value and impact of their College Access and Success programs. The following post was written by Greg Johnson, CEO of Bottom Line. Students continue to struggle to gain access to college. Even with the overall high school graduation rate in the U.S. increasing, the percent of low-income students who enroll in college is decreasing at a faster rate than the average population. When they do enroll, students from low-income backgrounds struggle to persist and graduate. Nearly half of low-income, first-generation students who enroll leave without ever earning their degree. In response to these barriers, federal and state governments and many communities have invested in intensive college advising and completion programs as a strategy to help first-generation students from low-income backgrounds apply to well-matched institutions and complete financial aid applications. These initiatives have garnered hundreds of millions of dollars in public and private investment, on top of the billion dollars spent on traditional high-school counselors. Yet, despite the volume of programs and the magnitude of financial investment in these organizations, rigorous evidence of their impact on students’ college success is fairly limited. Dave Borgal founded Bottom Line in 1997 to address an issue he experienced as a guidance counselor in NYC. Despite creating a college-going culture in the high school where he worked and helping students apply to college and make smart choices, they often didn’t enroll, or didn’t finish. From the start, Bottom Line has continuously challenged the notion that “being ready” and “getting in” to college was what is required for success. Rather, Bottom Line believes that the ultimate goal should be completion, as the consequences of completion are profound and long-lasting. Furthermore, helping students merely begin college (and having so few finish a degree) wastes the public investment made in critical financial aid programs and creates a false start to the talent development our cities need to thrive. Beginning 20 years ago as a small program supporting 25 high school seniors in Boston, Bottom Line has grown dramatically and now serves 7,000 students across Massachusetts, New York, and Chicago. 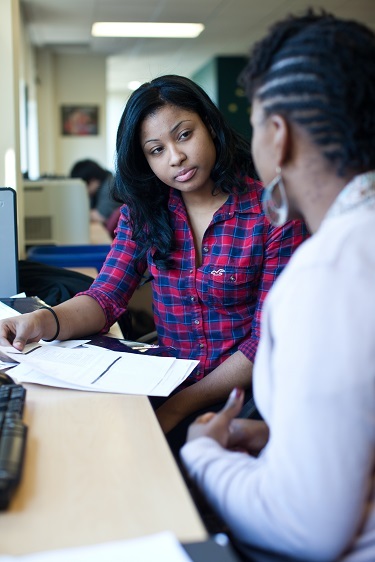 In our College Access program, counselors work closely with high school seniors to identify suitable colleges based on fit with their interests, match with their academic ability, and, most importantly, affordability. Counselors then work with students to complete compelling applications and apply for financial aid. FAFSA completion and thorough review of financial aid packages are critical components of our advising, helping our students fully leverage the public supports offered to them to make their education affordable. Our College Success program, which begins the summer before a student starts college, is focused on graduation and career readiness. Success program counselors provide frequent, on-campus advising so that our students can overcome challenges to accumulating proper course credits and choosing career-appropriate majors, maintaining sufficient financial aid, accessing on-campus resources, and staying focused on the long-term benefit of a degree. Bottom Line is a results-driven organization – and we hold ourselves accountable to ensure the long-term success of our students. We have always been committed to quantitative methods and tools to guide us in setting and reaching our goals. Our focus on collecting and analyzing data helps us measure and improve each aspect of our work. Because of our robust dataset of student and counselor activity, we have funded several independent evaluations. In 2010, a matched comparison analysis was completed and a few years later, a regression analysis helped build some promising evidence of our impact and warranted further study. In 2014, we decided to put our model to the most rigorous test: a randomized controlled trial. Researchers Andrew Barr (Texas A&M) and Ben Castleman (UVA) are tracking the results of two groups of students from the 2015 and 2016 graduating classes from Boston and Worcester, Massachusetts and New York City. One group was offered the opportunity to join Bottom Line as high school seniors and the other was not. The study is assessing Bottom Line’s impact on college enrollment, persistence and, ultimately, college graduation. The findings to date by the evaluators offer some confidence that our intensive relationship-based intervention can have a significant impact on enrollment and persistence in college and demonstrate a compelling opportunity for investment. 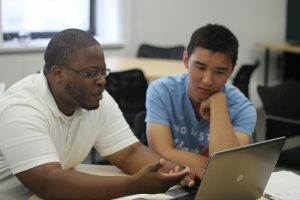 Bottom Line’s model of advising students during high school and into college, combined with explicit guidance to students about applying to and attending institutions where they are likely to be successful without incurring substantial costs, leads to large effects on college enrollment and four-year college enrollment. In contrast to most interventions, these effects grow over time as program participants are substantially more likely to persist in college than control students who did not receive Bottom Line advising. Bottom Line students are 10 percentage points more likely to be continuously enrolled in college since high school than control group students. Finally, the consistency of the results across space, time, counselors, and students indicate that the Bottom Line model provides a scalable solution to closing the income gap in college enrollment and success. With the strength of these results, it reinforces our belief that the cost of our program is small compared to the public investment already made in education and is well-worth the millions of dollars in returns that students will see in their personal earnings, that companies will see in their bottom lines through the contribution of our graduates as their employees, that cities and states will see in tax-income, and that cities will see in increased health and civic engagement. While there are still several years remaining in the analysis, the significance of the results thus far has created an interest among the researchers to also pursue additional public data sources to test some additional non-educational outcomes. We look forward to the additional information as it is released over the next few years. For the complete paper, please visit: http://bit.ly/BLRCTRPT.